WASHINGTON — Prosecutors don't intend to go after reporters for doing their jobs but could more forcefully try to get them to reveal their sources, a Justice Department official said Sunday. "We're after the leaker, not the journalist. We're after people who are committing crimes," Deputy Attorney General Rod Rosenstein told "Fox News Sunday." His comments come two days after officials pledged to clamp down on government leaks they believe undermine American security. Still, Rosenstein left open the possibility that reporters could be investigated for breaking other, unspecified laws. He declined to comment Friday when asked whether prosecutors would seek to jail journalists. Officials are reviewing guidelines that make it difficult for prosecutors to subpoena journalists about their sources, Rosenstein reiterated Sunday. He said some of the "procedural hurdles" may be delaying leak investigations. 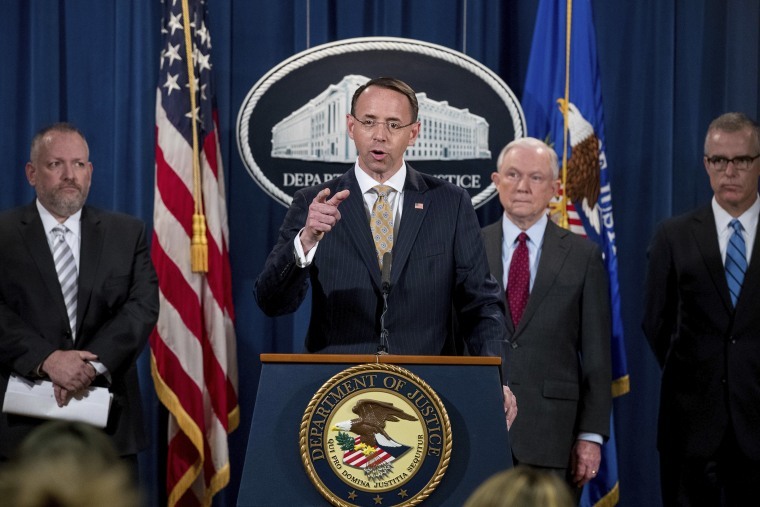 Without providing specifics, Rosenstein said the number of criminal leak probes had more than tripled in the early months of the Trump administration. Meanwhile, an Obama administration official echoed Rosenstein's concerns. "The leaks right now are really bad. I've never seen it this bad," former Homeland Security Secretary Jeh Johnson said on CBS' "Face the Nation." But he cautioned the Justice Department that going after reporters for their sources could have unintended consequences. "Before you decide to take on journalists, reporters, and perhaps subpoena their sources, be aware that the courts are going to get involved, and that has the potential for making bad law in this area," Johnson said.